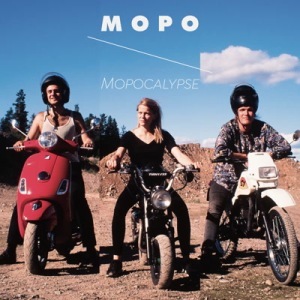 Mopo, a trio of sax, bass and drums from Finland, has been on the radar of international tastemakers already for a while thanks to their unique blend of jazz, punk, and inpisration from the Finnish nature. Now the trio of saxophonist Linda Fredriksson, bassist Eero Tikkanen and drummer Eeti Nieminen is set to release their fourth album on Helsinki's We Jazz Records. "Mopocalypse", a highly flammable mix of rough-around-the-edges jazz and melodic songwriting, is the remarkable next step for one of Finland's most potent exports. Mopo swing, grind, drive hard, and slow down with an impeccable sense of dynamics. Their music is raw and beautiful. The vinyl version of the album is housed in an "old-style" high gloss tip-on sleeve. The album comes with the first issue of "Mopo Zine" (12 pages), edited by Mopo, plus digital download with 2 bonus tracks.